This year celebrate Tu B’Shevat, also known as Jewish Arbor Day, by planting a tree with your family. It’s a great way to celebrate nature and remember that spring is just around the corner. Although it’s a fairly minor Jewish holiday, Tu B’Shevat (known as Jewish Arbor Day or new year for trees) is a lovely celebration of nature. Similar to Earth Day, it has become a time for raising ecological awareness, and there is a long tradition of planting trees in Israel to mark the holiday. To celebrate with your family, plant a tree close to home or sponsor one farther afield. If you have a backyard, then planting a tree is as easy as getting the seedling you want and picking the best spot. Use it as an educational opportunity to teach your kids about the life cycle of a tree, and how plants and trees grow. 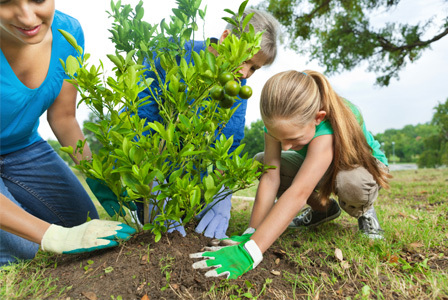 If you don’t have space for a tree, then consider finding a local park or organization that needs volunteers to help plant trees. Organizations like TreePeople in Los Angeles coordinate volunteers to plant trees around the city. It’s great for the community, gives you a sense of giving back, and allows you to meet others in your area. Plus there’s nothing more fun for the kids than getting dirty. Later you can visit the trees and watch them grow to feel a true sense of accomplishment. Or, if you don’t have time (or don’t want to get your hands dirty), you can still plant trees by proxy! Donate to an organization that plants trees in an area you care about. Every dollar donated to American Forests, for example, is used to plant a tree somewhere where it is most needed. To get in the real Tu B’Shevat spirit, there’s nothing more meaningful than planting a tree in Israel. A donation to the Jewish National Fund can be as small as a single tree or as large as a grove, and comes with a certificate of your choice that you can hang up and be proud of.